While moving from one place to another can often be pretty hard and time-consuming, it’s certainly possible to make the whole process less stressful. The first question that comes to mind when you’re in the process of moving is whether to hire professional movers or take care of everything yourself. While for most people a DIY move might seem like the more cost-effective option, in the long run, hiring an experienced moving company turns out to be a better solution simply because professional movers can handle all the lifting and unloading tasks much more efficiently, make everything less stressful and allow you to focus on essential tasks that must be completed well in advance. Packing is among those tasks that can have a great influence on just how organized and successful your process of relocation will be. In this case the type of moving boxes you use can make all the difference. You can either pack your valuables in cardboard boxes or in plastic ones, and each of these have their own advantages. To choose the packing supplies that will be most suitable for your individual needs it’s necessary to consider both the amount and type of items that have to be packed and moved. Let’s make a comparison and go through the pros and cons that come with cardboard and plastic boxes. The main difference between cardboard and plastic boxes can be found in their price. Cardboard certainly takes the lead when it comes to costs and it’s the best choice if you’re on a budget. Cardboard boxes are very inexpensive, you can buy a collection of multiple boxes for a couple of dollars, plus they come in many different sizes making them perfect for packing all kinds of items. Plastic boxes are more expensive, but it’s important to mention that their price can vary greatly in terms of both size and quality. Moving boxes should not only protect your valuables, but they also need to be easy to move around and stack as well. Since they’re ideal for smaller items like kitchen utensils, for instance, cardboard boxes are quite lightweight packing supplies which makes moving them from one place to another a simple task. 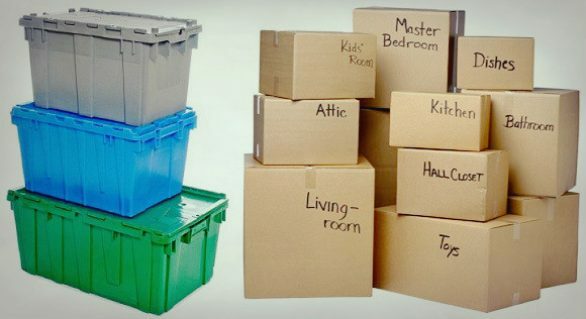 Due to their sturdy construction, plastic boxes are heavier, but many models come with handles that allow for easy loading and unloading of your belongings. When it comes to properly stacking your moving boxes, plastic ones are usually easier to arrange, plus these can save space and offer a lot of stability when stacked together. Available in various designs, from basic boxes to models specifically designed for your sensitive items, cardboard models are great for both relocation and storage. Plastic models usually have a standard design that might not fit some of those decorations and items that have a unique shape. In terms of durability and protection however, cardboard is naturally far more prone to damage, while plastic is a highly-resistant, waterproof material that will keep you belongings safe during transport.